Alright, I know what you are thinking. That this is some Martha Stewart publication and that, in turn, will be the most difficult recipe to create. I just want to debunk this thought of yours and tell you that it’s a pretty simple recipe. REALLY! Think about it, if a twenty-something male bachelor can make it, you can too. For my example (pictured above ^), I had stuffed an eggplant and a couple onions (red and white). For the stuffing I used shrimp, mushrooms and peppers. You can really use anything you want to, but I would suggest highlighting one ingredient or possibly a complimentary ingredient or the flavor will get too busy. Again, this is my recipe that I made, but you may use whatever sounds good to you simply because the options are boundless. Chop up the shrimp and remaining veggies. Heat remaining olive oil in a large skillet over medium heat and saute the shrimp and garlic until the shrimp turns pink (about a minute). Add remaining chopped vegetables, pour in wine (or apple cider vinegar) and cook for an additional 5 minutes. Transfer to a large bowl and mix in the bread crumbs, additional seasonings, and 1/4 cup Parmesan cheese. If mixture is too dry, stir in a bit of olive oil. Too moist, stir in more bread crumbs. Stuff this mixture into the eggplant and onion shells and sprinkle the tops with the remaining Parmesan cheese. Pour the water in the bottom of the dish as to keep the food well hydrated during the baking process. Bake for 30-40 minutes, or until the eggplant is tender. That is how it’s done. So essentially, halve eggplant –> saute shrimp and vegetables –> stir in bread crumbs –> stuff eggplant –> bake. Not too bad. The recipe for the butternut squash pictured is pretty simple too. Just halve it and scoop out the seeds. Butter the flesh and sprinkle with brown sugar (and put a bit more in the opening). Bake for about an hour or until the flesh is tender. 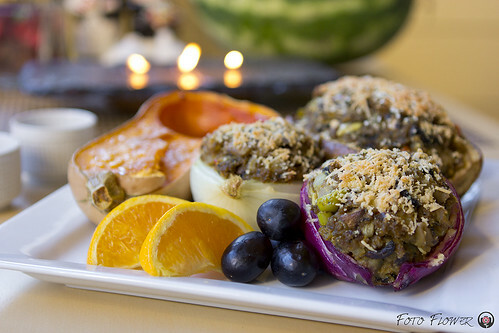 Stuffing food is a great idea for the coming Fall season and the holidays quickly approaching. It’s gotten me in the mood to see what other foods would be good to stuff. I may be trying out stuffing apples and oranges to see what kind of dessert I can concoct. If you decide to make this recipe, let me know your variation. I’d love to hear it. This is one of the things that I have been debating ever since I was first introduced to the portobello mushroom, what is the best way to prepare it??? What I’ve come to find out is that it is very hard to screw up the portobello mushroom. With the natural rich flavors and the versatility that it holds, they can become the staple ingredient in any dish or meal whether it be a side of the main ingredient. Just remember that if you decide to store them for a day or two before using them, always, ALWAYS, store them in a paper bag rather than a plastic bag. The paper bag will allow them to breathe easier which will show up in the flavor in the final product. My favorite way to prepare the portobello mushroom is to grill it. You don’t need much seasoning, just a bit of pepper, and I would suggest wrapping it up in aluminum foil as to not over burn it’s fleshy outer cover. If you enjoy that seared look then take it out of the foil at the very end and sear it for about thirty seconds to a minute. That, however, is not the recipe I will be sharing today. I’ve recently been getting into steamed vegetables and awakening my senses to the boldness of flavor that you can achieve with this method. With most vegetables this is the most preferred way to cook vegetables. I will talk about the benefits of steaming vegetables in a different post later on. My recipe is very simple and only includes 5 ingredients (one of which is ground black pepper). Due to the meatiness amount of protein that portobello’s hold there is not the need for a meat. That makes this perfect for vegetarians and vegans. There are more ingredients if you are like me and like to improvise, but I will leave that up to you to be adventurous. The two main ingredients other than the mushrooms will be red cabbage and onions (I use white). I have chosen red cabbage because it has much more immunity boosting carotenes than any other cabbages. And for all you ladies out there, the indoles (an aromatic heterocyclic organic compound) in it have links with protection against hormone based cancers such as breast, uterus, and ovarian. Onions are just a good overall, well-balanced food that needs to be a part of our daily diets. They are rich in cancer fighting compounds which prevent and block the effects of carcinogens (cancer-causing particles). Rinse off the portobello(s), cabbage and onion and chop them up to bite size pieces. Start boiling the water in a large pot and place steamer inside. Once boiling, put portobellos and veggies in and place lid on the pot. Turn the heat down to medium-hot to medium heat and let steam for about 5-10 minutes (depending on how cooked you like your veggies). When the onions become almost transparent everything should be steamed perfectly. Season with a bed of rice and season with black pepper to taste. When steaming the vegetables, I will usually put something in the boiling water such as lemon or lime juice, soy sauce, or worcestershire sauce to give the steamed veggies and even fuller flavor. Besides cracked black pepper, other seasonings may be added. I enjoy lemon pepper, but I would love to hear what you come up with and I’ll try it out for myself. Try other vegetables to steam with the portobellos. I have found that broccoli and cauliflower go great. In place of rice, try making a pasta out of it. I look forward to hearing variations of this. Tell your friends to subscribe too. I’ll be posting as often as I can. Au revoir, and happy eating!! Portobello mushrooms are amazing. Eat them, they’re delicious and good for you. Great on the grill. Here are a few reasons why they are good for you. The body’s ability to produce its own antioxidants is enhanced by the selenium in portobello mushrooms which operates through the DNA. Hemoglobin synthesis (needed for the transportation of oxygen through the blood stream) is supported by the iron and copper. Portobello mushrooms have a high level of riboflavin which gives a healthy dose to cellular energy production. Adrenal gland function is aided by the pantothenic acid in portobello mushrooms. The very high levels of Zinc helps boost the body’s immune function such as wound healing and cell division. A reduced risk of Alzheimer’s disease has been linked to the high amounts of niacin found in portobello mushrooms. Portobello mushrooms will retain their nutrients when stir-fried, grilled, or microwaved. I prefer them grilled because the flavor really gets kicked up a notch. I’ve been steaming them lately and due to the enormous amount of flavor they hold you only need a bit of pepper and you’ve got yourself a main course. Hello fellow foodies. My name is Mark and this is my first blog so I’m very excited about starting this up. I love to cook, love to eat, and love to share. I will be posting up my own recipes as well as information pertinent to a healthy lifestyle. Come, gather around the table. The food is just about ready.